Better Call Bill Warner Investigations Sarasota Fl: US Justice Dept issues extradition request for Julian Assange he faces 5 years in prison federal charge conspiracy to commit computer intrusion. US Justice Dept issues extradition request for Julian Assange he faces 5 years in prison federal charge conspiracy to commit computer intrusion. British police have arrested Julian Assange after Ecuador withdrew his asylum status. The arrest was made at the Ecuadorian embassy in London, where the WikiLeaks founder has been claiming asylum since 2012. Assange was carried out of the embassy by authorities, and taken into custody at a central London police station. Assange could be heard pleading that “the UK must resist... this attempt by the Trump administration.” Police later confirmed that Assange was “further arrested” on behalf of US authorities under an extradition warrant. “He is accused in the United States of America of computer related offences” a spokesperson for the Home Office said. An extradition hearing will take place at Westminster Magistrates’ Court. The WikiLeaks founder was first granted asylum in 2012 in order to avoid extradition to Sweden over allegations of sexual assault. Since then, he has been accused of aiding Russian interference in the 2016 US presidential election by publishing over 19,000 emails stolen from the Clinton campaign and the Democratic National Committee. Last year 12 Russia intelligence officers were charged over the crime, one of whom was in contact with the WikiLeaks founder. 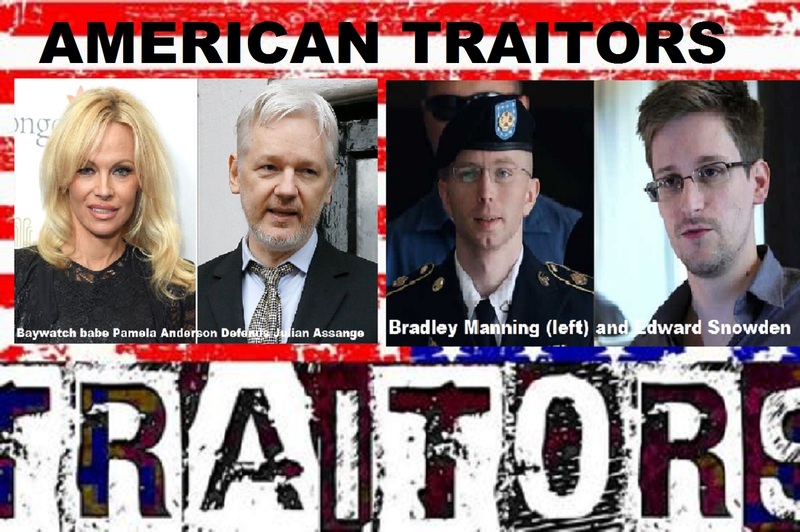 Assange is charged with conspiracy to commit computer intrusion and is presumed innocent unless and until proven guilty beyond a reasonable doubt. He faces a maximum penalty of five years in prison if convicted. Actual sentences for federal crimes are typically less than the maximum penalties. A federal district court judge will determine any sentence after taking into account the U.S. Sentencing Guidelines and other statutory factors. The extradition will be handled by the Department of Justice’s Office of International Affairs. An indictment contains allegations that a defendant has committed a crime. Every defendant is presumed to be innocent until and unless proven guilty in court. Baywatch babe Pamela Anderson flips out over Julian Assange arrest. Pamela Anderson Defends Julian Assange and Asks for His Release: ‘He Is a Hero’. Pamela Anderson continues to defend WikiLeaks’ editor-in-chief Julian Assange. The "actress", 49, brought a vegan lunch to Assange, who has been staying in the Ecuadorian Embassy since 2012 to avoid extradition to Sweden, back in October and hand-delivered even more goodies last month. And now, in a statement released to PEOPLE, the star says Assange should be allowed to go freely. 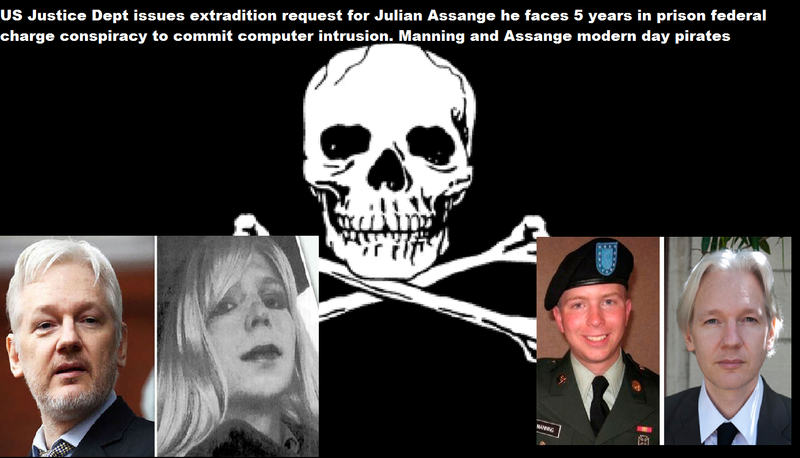 Anderson ended her statement with a plea to release charges against two other famous whistleblowers, Edward Snowden and Chelsea Manning. Snowden now resides in asylum in Russia after the American government charged him with violating the Espionage Act and stealing government property, while Manning is two years into her 35-year sentence at Fort Leavenworth military prison for furnishing 700,000 classified documents to WikiLeaks. Labels: US Justice Dept issues extradition request for Julian Assange he faces 5 years in prison federal charge conspiracy to commit computer intrusion.